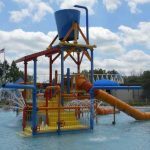 Waterford Oaks Waterpark review and pics. 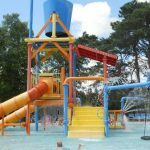 Waterford Oaks Waterpark in Waterford MI on Scott Lake Rd. Admission prices info, hours for the 2019 season. 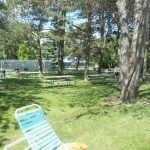 Waterford Oaks Waterpark is an affordable trip conveniently located only minutes from M-59 in Waterford, MI. I took my niece to Waterford Oaks on a weekday and she and I both had a great time. 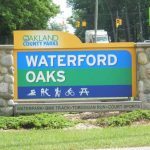 The park is located within the spacious Waterford Oaks park and is loaded with fun activities for the kids. Also located within the park are Paradise Peninsula Playscape and a BMX Track. 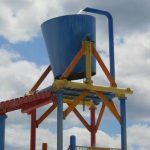 We first made our way to the “Big Bucket” water playground at Waterford Oaks Waterpark that features a massive bucket that fills up with water and pours down on anyone within the child’s play area. Finally, we circled back to the massive wavepool that everyone seemed to enjoy (tubes are provided by the park). 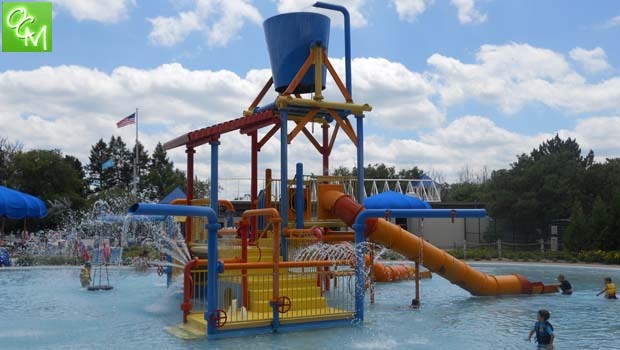 The Waterford Oaks Waterpark wave pool is a blast for kids. When the bell rings, the water goes from calm to huge waves in a matter of seconds. 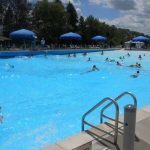 The Waterford Oaks wave pool is challenging for young swimmers. Make sure the kids have their safety vests or water wings on when the bell rings if they’re not strong swimmers! The park featured plenty of area for activities and events in covered areas. 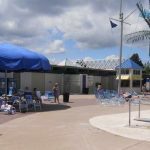 Even when Waterford Oaks Waterpark is busy, there still seems to be enough room to stretch out. 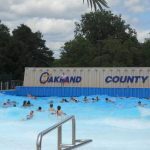 For more info on the Waterford Oaks Waterpark Review, visit www.DestinationOakland.com.